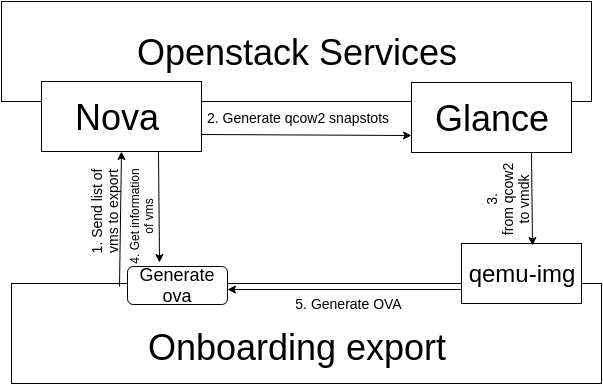 At ICCLab, we have recently updated the Openstack OVA onboarding tool to include an exporting functionality that can help operators migrate and checkpoint individual VMs. Furthermore, researchers can now export VMs to their local environments, even use them offline, and at any time bring them back to the cloud using the same tool. The OpenStack OVA onboarding tool automatically transforms selected virtual machines into downloadable VMDK images. Virtual machines and their metadata are fetched from OpenStack’s Nova service, and made packed as OVA file. The tool offers a GUI integration with OpenStack’s Horizon Dashboard, but can be also deployed separately. QCOW2 images have the same size as instance disk space. It means that download image of X0 GB will take some time. Network configuration of virtual machine in openstack deployment should be configured for non cloudinit setup too, otherwise the exported image will not have proper networking within Virtualbox or similar virtualization tool. All NAT ports are required to have the network called “private” in the tenant. We’ve prepared a short video about this tool’s deployment and its installation steps. As always, the code is open-source, so let us know what you think. This entry was posted in *. *, Open Source, OpenStack and tagged Horizon, Onboarding, OVA by serh. Bookmark the permalink.